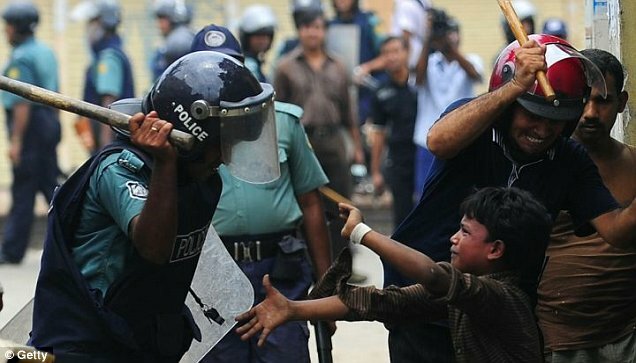 file/children.jpgMore than 80 people were injured when textile workers and members of an opposition Islamic party in separate clashes with police. Supporters of the largest Islamic party, Jamaat-e-Islami, battled with officers after three of their leaders were detained on charges of hurting Muslim religious sentiment. Clashes occurred in at least half a dozen districts while 20 Jamaat activists were arrested in the capital Dhaka after storming a court compound where the leaders were due to appear. The trio named as Jamaat leader Moulana Motiur Rahman Nizami, his deputy Ali Ahsan Mohammad Mujahid and another key party figure, Moulana Delwar Hossain Saidee, were arrested following complaints that Nizami had been compared to Prophet Mohammad – a punishable crime under Islamic law. Elsewhere, police using batons, tear gas and water cannon fought street battles with 15,000 textile workers demanding back pay and an immediate rise in monthly wages.